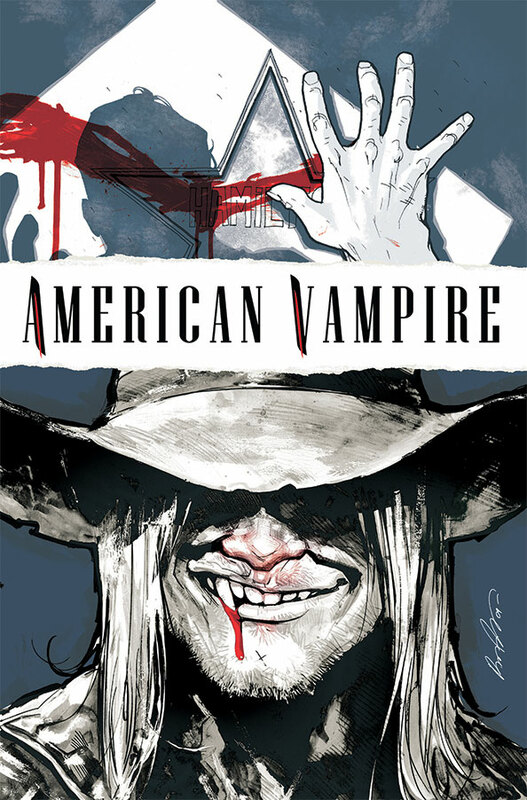 An interesting character is rising from the grave in American Vampire #2. Readers are treated to a bite more of the candy craving Skinner Sweet in two continuation stories crafted by Scott Snyder and Stephen King. Snyder kicks things off by a visual kiss by Skinner Sweet which produces the power of transformation. As in American Vampire #1, blood contact to they eye seems to be the mechanism which produces the evolved creature of the...day? Skinner Sweet describes how the old European-like vampires are a thing of the past, while a new era in vampires is evolving in the new lands. The new improved model is the American Vampire. Scott Snyder not only give Skinner Sweet attention capturing personality through his smooth and confident dialog, but through a comical note left by Sweet on a refrigerator door. Sweet points out the difference between the old-school vamps and the American vampires: they like "faggy clothes" (faggy: often used in the 20's) and the American vamps...well, Sweet "don't want to ruin the surprise" for the newest vampire. Sweet actually writes that on the note along with a message about a closet filled meal. King's story continues on after the supposed death of Skinner Sweet, giving more background on the older fanged fellas and how it is that Sweet is appearing in both the 1880's and 1920's. King uses two back and forth time lines which contrasts the sadness of life, which at times is lonely and doesn't last, with the loneliness of death and eternity which oddly enough can still have it's pleasures. The art and coloring is once again handled with great attention to story detail by Rafael Albuquerque and Dave McCaig. Every page is filled with something Sweet. There are expressive smiles, smirks and frowns, and tone-tastic lighting in every setting. 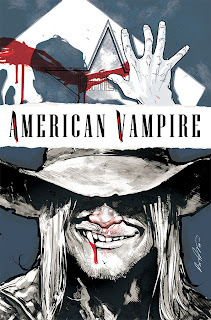 While the comic of the day, American Vampire #2, is no Dracula: Dead and Loving It, Snyder and King's Sweet new character may one day fit into vampire lore along with Max Schreck, Bela Lugosi, Christopher Lee, Gary Oldman and Leslie Nielsen, the only American Vampire.